England has been crowned the big cheese at an international competition, beating French, Swiss and Dutch cheesemakers with a soft blue from Bath. You can buy it here, now! In the 26th edition of the World Cheese Awards, hosted by the BBC Good Food Show in London, a family of third-generation dairy farmers recently turned cheesemakers beat nearly 2,600 cheeses with their Bath Blue. The blue-veined cheese is made with organic milk and ripened in traditional stone-built rooms for eight to 10 weeks. Bath Blue Winner The Best Chese in The World 2014! Other countries represented in the competition included New Zealand, Canada, South Africa, Mexico, Argentina and Brazil. "Sometimes blue cheese can have a metallic flavor, and if it doesn’t it can overloaded with salt, but this was perfectly balanced – a classic blue, flavors that develop slowly in your mouth,” said Canadian judge Louis Aird of the Bath Blue. Runners-up included a cheddar from Barbers Farmhouse Cheesemakers, also from the UK, and Dinarski Sir -- a cheese made from both cow’s and goat’s milk -- by Croatian producer Sirana Gligora. 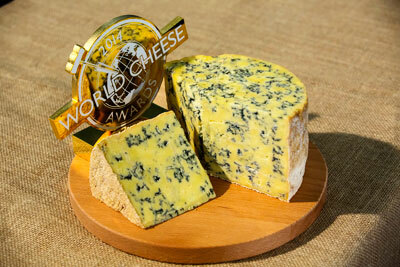 Read about the 2014 World Cheese winner, Bath Blue here.